A woman who was missing from Andover was found safe in Salina. 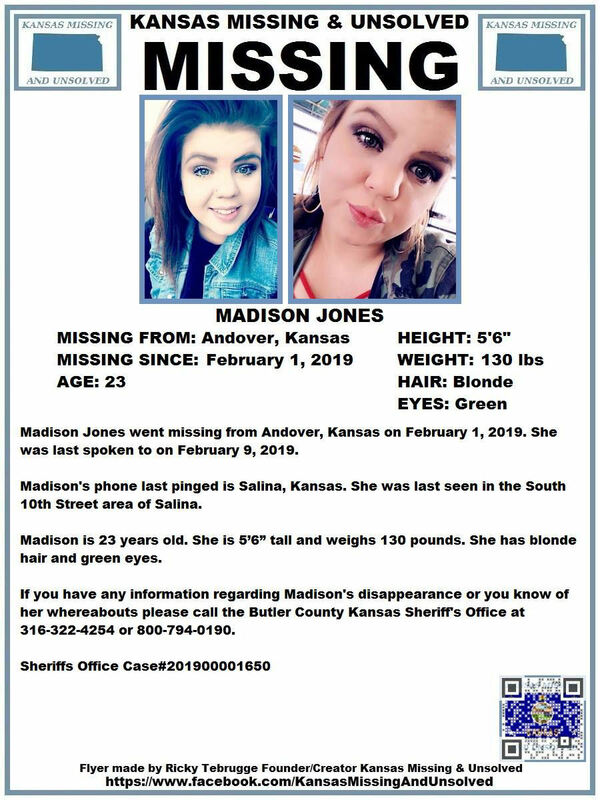 Kansas Missing and Unsolved tells KSAL News 23-year-old Madison Jones went missing from Andover back on February 1st. Last contact with her was made on February 9th. Madison’s cell phone last pinged in the Salina area. She was last seen in the S. 10th Street area of Salina. The group says Jones was found safe in Salina early Tuesday. ORIGINAL: A woman who is missing from Andover might be in the Salina area. Anyone who knows where Jones who might be, or who may have seen her, is asked to contact the Butler County Sheriff’s Office at 316-322-4254 or 1-800-794-0190.